World's Best Down®, a bold claim from the leader in adventure gear, Eddie Bauer®! 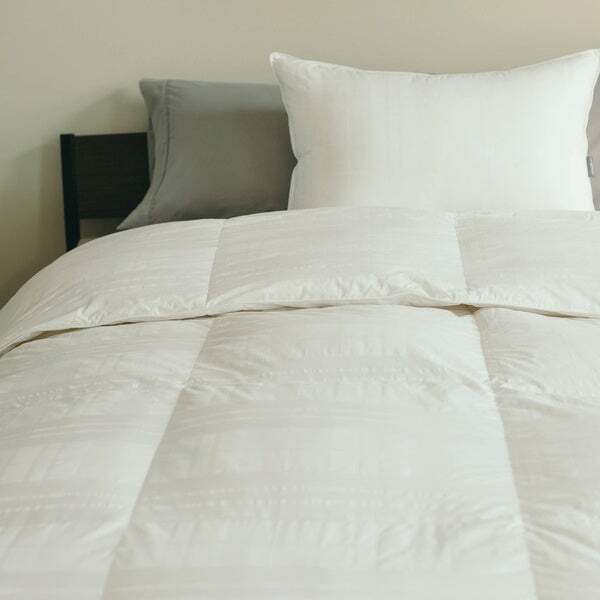 This comforter is the ultimate in all seasons comfort featuring snuggly soft down. Hugged by a silky 400 thread count damask cotton, in Eddie's classic plaid pattern. USA super clean fill™ features down cleansed at twice the government standard. Dimensions 98.0 In. X 108.0 In. X 0.25 In. We have been sleeping under our new Eddie Bauer 400 Thread Count down comforter for nearly a month now and we are absolutely IN LOVE with it! We let it air out and fluff up for one day before pairing it up with our favorite duvet. Right out of the package, it had almost NO ODOR, unlike most down comforters I've purchased in the past. It really is the most perfect medium weight. We live in coastal southern California, and I think this could easily be used all year round with a heavier duvet in winter and a light-weight duvet during the warmer summer months. There was a minimal amount of down fluff in the air right out of the packaging, and I haven't noticed any now that we have it inside a duvet. The 100% cotton, 400-thread count cover feels very soft and high quality. The fact that it was assembled in the USA was a a selling point as well. I would absolutely recommend this down comforter. I feel we received a high quality product for a very reasonable price! Good quality and year round weight. Well constructed with enough loft per baffle -- the cover material is quite nice as well. Love the slightly oversized dimensions which keep it full inside the duvet cover/avoids the inevitable lopsidedness when the comforter is smaller than the duvet. I've been wanting to switch to a duvet and duvet cover for a while and after much research and comparing went with this duvet. I live in an area of hot summers and mild winters, so I loved that this one is an all season and I can use it year round. As soon as I took it out of the package it started fluffing up. I'm very pleased with the quality. The only con I have found so far is that it doesn't have ties to put into the cover, but I just attached some large safety pins to the 4 corners to tie my cover to. I may go back and sew a ribbon on there instead, but that is an easy fix. Overall, I would definitely recommend this as a light-weight, year-round comforter. Perfect weight! At first I thought it might be too light, but after the recommended time fo it to fluff up, it is as described on your website. Year round, cozy, and perfect for year round use. I feel that I got a great price on a great product that has the extra bonus of actually being made in the USA . It arrived quickly too. The material is so nice , and the comforter has a nice warmth but not hot . I love it and I am happy I bought it . This comfortable is so soft, comfortable and warm! Love it! Hard to want to get up. We are very pleased with this down comforter. It is light yet warm. It can be difficult to put a king Comforter into a duvet, but it is light enough to be able to do so without a problem. Awsome comforter, would definetly buy again. This is a great down comforter but man is it hot. I was not expecting this to be so warn since it was listed as All-season down but it was extremely warm in 30 degree temperatures. I find myself tossing this off during the night. Might try another with less down. This comforter is very soft and fluffy without being too hot. I can sleep comfortably with this without any thermostat adjustment. Great item. "Are there loops to hold the duvet cover in place?" "what is the size of the queen comforter"
Queen is 90 x 98 inches. "what is the size of the queen comforter?" The queen is approximately 90 inches x 98 inches with a 39-ounce fill.